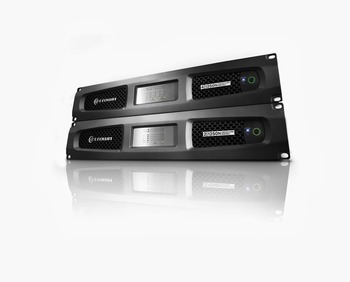 ELKHART, Indiana — HARMAN’s Crown Audio today announced it is now shipping the four highest-powered models in its DriveCore Install (DCi) Series power amplifiers. Available in both DCi Analog and DCi Network Ethernet-linkable configurations, the 4-channel and 2-channel amplifiers deliver 1,250 watts per channel into 2, 4 or 8 ohms and 70Vrms and 100Vrms (all channels driven; 2,500 watts in bridged mode), and are designed for applications such as stadiums, arenas, amusement parks, clubs and casinos where the highest amounts of power are required. The models include the DCi Analog 4-channel DCi4|1250 and 2-channel DCi2|1250, and the DCi Network 4-channel DCi4|1250N and 2-channel DCi2|1250N. Both share the same specs, with the DCi Network amplifiers adding Ethernet connectivity that enables networked configuration via RJ-45 cable and BLU link digital audio transport. “As the successor to our long-time industry-standard CTs Series, we introduced the DCi Series as the undisputed new standard in installed sound amplifiers,” said Daniel Saenz, Business Segment Manager at Crown Audio. “As such, having high-power models in the lineup to handle the largest applications was mandatory. These four new amplifiers bring an entirely new level of performance, flexibility, sound quality and reliability to the most demanding large-scale amplification requirements. With the feature set of the networked amplifiers, the system is simplified through easier connections with RJ-45 for BLU link and fewer hardware devices with rack density of high output 4 channel amplifiers. Although remarkably powerful, the amplifiers are just 2U rack spaces high, to conserve valuable installation space. The amplifiers’ compact size, high efficiency and superior sound quality is made possible by HARMAN’s proprietary DriveCore amplifier IC chip. The DriveCore chip combines the amplifier driver stage into the power output stage along with additional audio-signal functions – yet is about the size of a postage stamp. DriveCore and the DCi Series’ leading-edge Class D amplifier topologies dramatically reduce size and power consumption requirements and yield much more energy-efficient operation. Crown DCi Series amplifiers can be operated into 8-, 4- or 2-ohm loads and offer direct drive “constant voltage” capabilities for 70vrms and 100vrms amplification without the need for a step-up transformer, yielding higher audio quality in distributed audio applications. The amplifiers incorporate an exclusive Global Power Supply that is designed to deliver maximum power in any country and their universal AC input accepts voltages from 100 – 240 VAC, 50/60Hz (+/- 15%). The DCI Network amplifiers offer networked monitoring and control via HARMAN HiQnet™ Audio Architect system software. The network capable DCi Series amps offer digital audio connectivity using the company’s proprietary BLU link as well as analog inputs.The DCi Series is Crown’s most green amplifier line ever, with a selectable powersave auto-standby mode where the amplifier will power after 30 minutes of no input signal and consume less than 1 watt. In addition to the amplifiers’ balanced 3-pin input connectors and 2-pin terminal strip output connectors, a rear-panel AUX port enables the amplifiers to be integrated into control systems for remote on/off and amplifier fault monitoring. Crown DCi Series amplifiers are built for the most demanding conditions of continuous professional use and carry a three-year, no-fault fully transferrable warranty.